With nearly 1500 megawatts, Massachusetts has the seventh-greatest solar energy capacity in the country, enough to power a quarter-million homes. It has the second-most solar jobs, with over 14,500. Already in a leading position, Massachusetts in January developed a new incentive program to double its solar capacity to more than 3 gigawatts. The core of the Massachusetts policy is a fixed contract price (inclusive of the value of energy and incentive) and a fixed term for solar projects less than 5 megawatts. So instead of getting net metering for energy and a solar renewable energy credit as an incentive, the latter of which could fluctuate significantly over the project’s life, projects will have a near-certain revenue stream. The prices will be differentiated by capacity. Projects larger than 1 megawatt will participate in a competitive bid for the first block of capacity, with a cap on that first block of $0.15 per kilowatt-hour for projects 1-2 megawatts, and $0.14 per kilowatt-hour for projects 2-5 megawatts. The following graphic shows how the projects with the lowest bids will get built, receiving the clearing price of the last project in the 100-megawatt auction. In this illustration, all winners receive the contract price of $0.14 per kilowatt-hour. 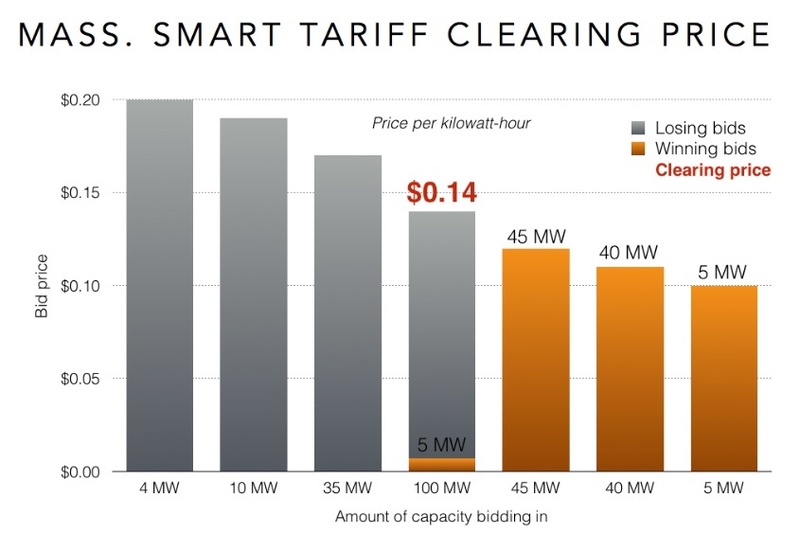 This clearing price will also be used for determining the prices for the smaller projects, with the 1-2 megawatt clearing price serving as the index. The following chart shows the contract prices for solar projects of various sizes, based on a hypothetical 14-cent clearing price for the 1-2 megawatt auction. Contract prices don’t reflect what the actual per-kilowatt reimbursement will be to the producer, but rather set a floor. 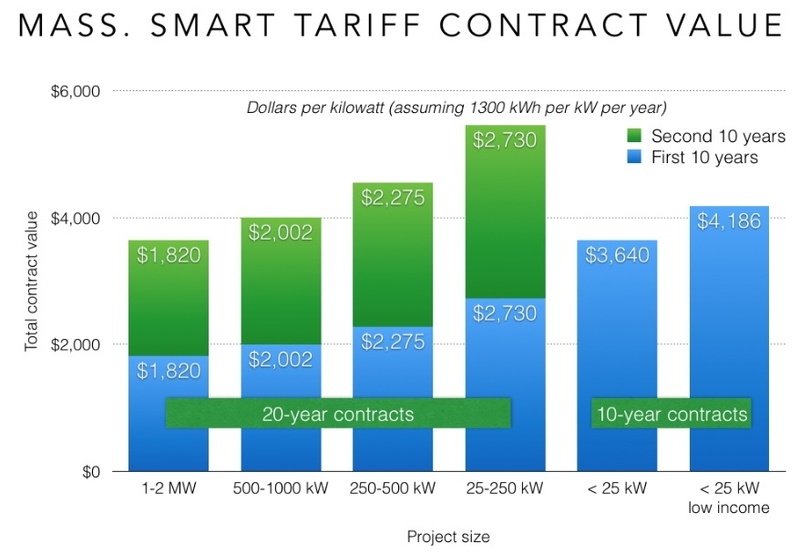 For net metered projects, for example, the incentive will be determined by subtracting the “volumetric distribution + transmission + transition + three-year average basic service rate for this particular rate class” (base rate) from the contract price, and then that value will be fixed over time. So if a 25-kilowatt project has a 28-cent contract price but an 18-cent base rate, its 10-year incentive will be $0.10 per kilowatt-hour. 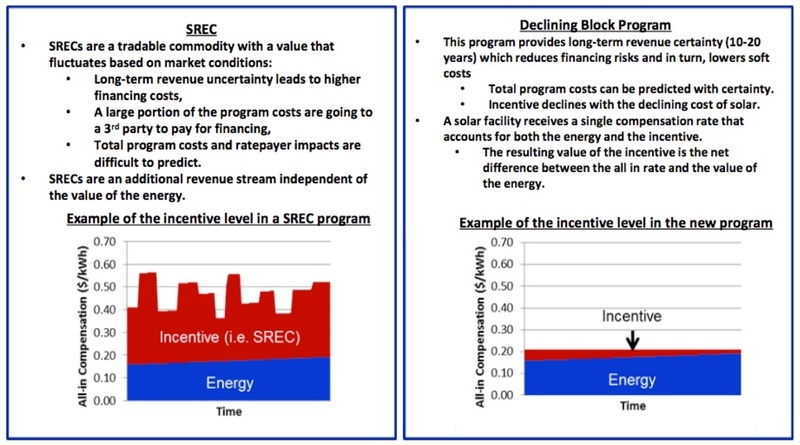 The following graphic, taken from a presentation by the Massachusetts Department of Energy Resources, shows how a net metered solar project receives an incentive on top of the net metering rate. 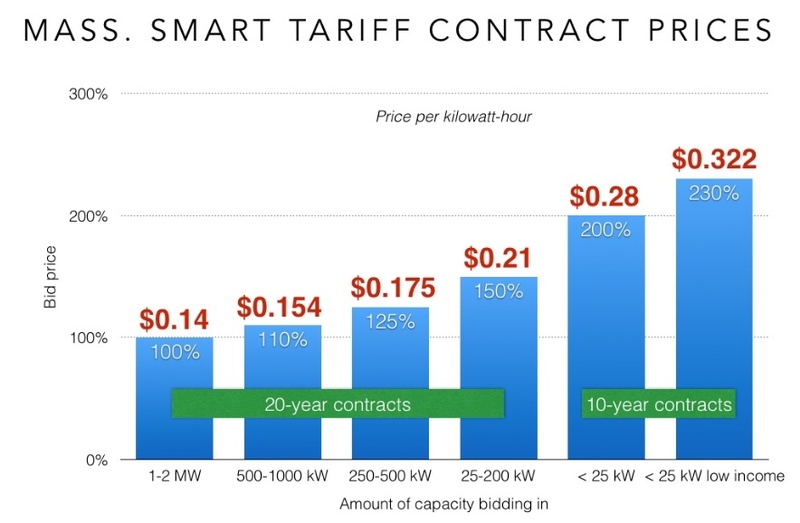 The contract prices start with the bidding results, but rise significantly for small projects, to 150% of the index price for projects as small as 25 kilowatts. Projects smaller than this get a much higher contract price, but also a shorter contract. The advantage will be in covering finance costs, which are almost always incurred in the first 10 years. However, the term limit means that the effective tariff value may be lower for smaller projects. 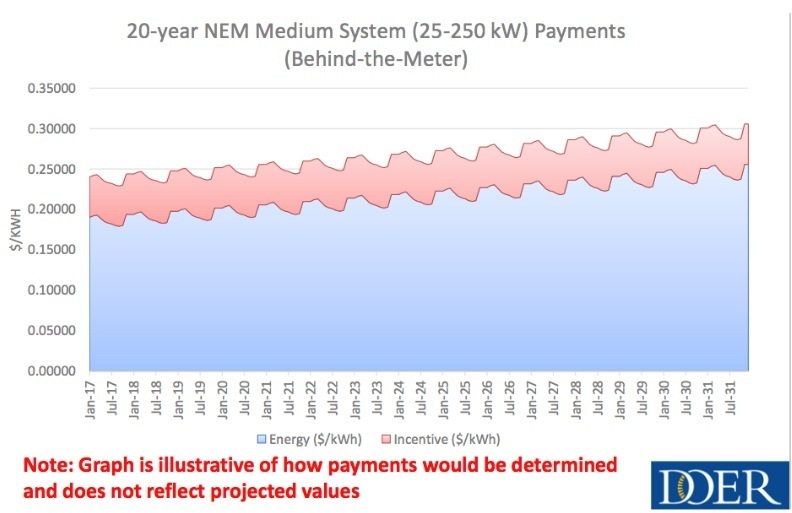 To be clear, however, the contract price for behind-the-meter projects is only used to establish the fixed incentive level, not the total annual payment. The following chart illustrates the contract value for projects in each capacity bucket, assuming equal production of 1,300 kilowatt-hours per kilowatt (DC) of capacity per year and a fixed price over 20 years. The contract price is not the full story for solar project compensation, however. The new tariff also provides additional incentives (called “adders”) for projects that meet certain criteria. 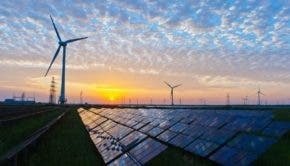 These include bonuses to the per-kilowatt contract for projects cited at certain locations (such as those mounted to buildings, at landfills, or built as solar canopies) and projects that include energy storage. Adders also come into play based on the inclusion of certain off-takers, including public entities or low-income property owners. The following table from the Department of Energy Resources illustrates these adders. One key element of the bonuses is that they can stack, meaning a project can collect them for multiple criteria. The following chart shows how adders would work for a 600-kilowatt solar project with a baseline contract price of $0.154 per kilowatt-hour, that is installed as a solar canopy and serves a public entity. The intent of the adders is clearly to incentivize development of solar projects that may serve a public interest not currently captured by the solar market. Fleshing out the market with these Incentivizes is an essential component of the shift toward an Energy Democracy model of renewable energy ownership. There is also at least one form of “subtractor.” Projects on greenfields may incur a penalty to their contract price, a provision designed to reflect opportunity cost of the land use. To ensure participation among the smallest distributed solar projects, each block of program capacity reserves 20% for solar projects under 25 kilowatts, for a total of about 320 megawatts of smaller-scale solar of the 1,600 megawatt program. To avoid unequal treatment, program costs will be divided proportionately among distribution utilities based on their total share of state electricity sales. This avoids potential issues with small utilities hosting a disproportionate number of solar projects and in turn bearing the costs. Like Germany’s feed-in tariff or California’s Solar Initiative, the Massachusetts SMART Tariff also bakes in declining solar prices. In particular, the contract prices (and adders) will decrease by 4% per block. Each block will include approximately 200 megawatts of capacity, with one-fifth of that capacity reserved for solar projects 25 kilowatts or smaller. The following chart from the Department of Energy Resources, shows how the total contract price falls with each new block of capacity, but the incentive level falls even faster with the presumption that the value of the energy (the retail rate) will rise over time. 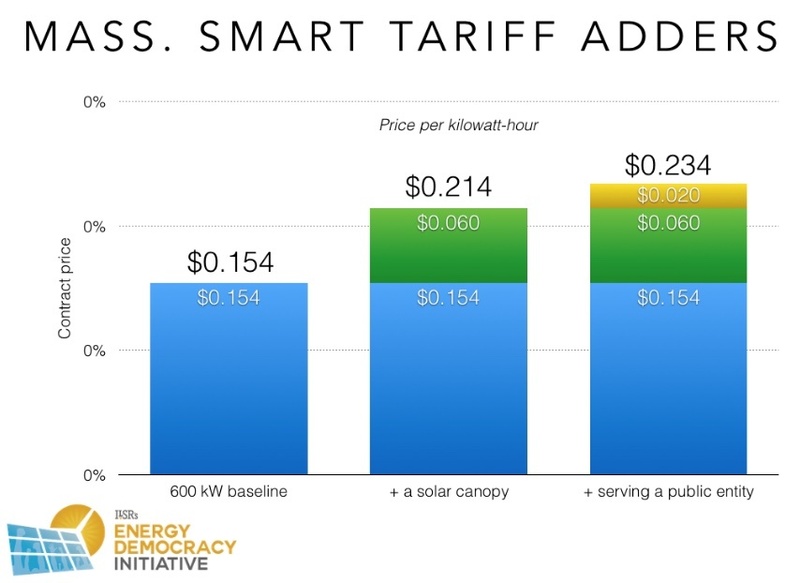 Clear advantages of the SMART tariff program are predictability and certainty, for both regulators and program participants. These factors ensure the program will be more durable for the long term, even as the renewables marketplace in Massachusetts evolves, rather than merely sparking a short-term boost to renewable generation development. The Department laid out its rationale in the presentation of the final rules, shown below. Massachusetts’ SMART tariff is being touted as a second-generation program, designed to double installed capacity of solar from 1,600 to 3,200 megawatts over the next several years. It applies several lessons learned from earlier feed-in tariff programs in Ontario and Germany, setting initial prices competitively and adjusting over time based on capacity rather than time. It encompasses many ways to differentiate projects, going far beyond project size to include location and even beneficiaries. It may not be the perfect solar program, but given the care and detail in putting the SMART program, it’s certainly one to watch. For more information on the SMART program, see this webinar by the Clean Energy States Alliance.